The Erdvark Root Rake is mounted in front of a Dozer blade or Front End Loader by welding the supplied brackets to the blade or bucket. The Root Rake hangs loose and cleans itself by moving backwards. 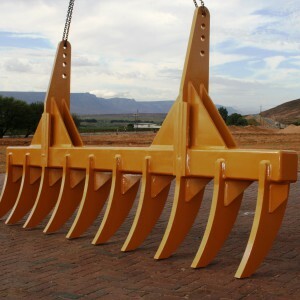 Erdvark will manufacture the Root Rake to your Dozer blade or Front End Loader dimensions and shape. The Root Rake can work 450mm mm deep and will rip up all roots, brush, small stumps, and loose plant material. You can push this material onto a heap or work it into a row. This is the most effective piece of equipment for land clearing.